gas comparable sawing power while reducing vibration and noise. + Freedom from cord restrictions? x Pulling a cord to start the engine? If you answer “Yes” to the first questions and “No” to the second set, then let’s get started with this review, or click the item in the table below to skip to your most pressing question! But if you are already convinced that you are ready to get the job done with no starting hassles, click the button below and head right on over to Amazon to make your purchase and may G-Max be with you! 1 What are the Important features of this cordless electric model? 2 What safety features does the Greenworks 40v chainsaw have? 3 How long will the G-Max 40v battery last? 3.1 How good are Lithium Ion (Li-ion) batteries? 4 What is a brushless motor? 5 What else should I know about Greenworks 40v Cordless Chainsaw? 6 Is there a best electric chainsaw? What are the Important features of this cordless electric model? G-Max 40v 4Ah battery: Last for up to 150 cuts or a cord of wood with 2 hour recharge time. Carries a 2 year warranty. Brushless motor: 30% more torque with 70% less vibration. Greater efficiency, less noise than a comparable gas engine. Push-button start: do I need to say much about how great it is not to have a pull start? Auto chain oiler: ensures that the chain and bar are sufficiently lubricated during use. Tool-free tensioning: although not essential to safe and proper operation, it is so much easier to be able to adjust the tension on the side of the saw without having to stop and remove a tool to use for tightening the chain. You will be much more likely to make the adjustment whenever it is necessary and with the added benefit that there is no tool to lose! Scabbard and Soft case included: although not essential, the scabbard is both an important safety feature for anyone near the chainsaw when it is not in use and will protect that chain from damage: protects your investment. What safety features does the Greenworks 40v chainsaw have? Safety Switch: Turning on and running is a three-step process in which the on/off button activates the switch trigger. Press and hold the on/off button, then squeeze and hold the switch trigger, then release the on/off button. When the switch trigger is released the motor stops. Hand chain guard: Between the operator’s hand and the chain is a guard high enough to deflect the chain if it were to come loose. Chain brake: the hand chain guard acts as a chain brake when pushed forward. Low-kickback chain: reduces the danger of the bar flying backward when the nose or tip comes in contact with something and subsequent loss of control of the chainsaw. Bucking spikes: protect the saw when bucking a tree trunk. G-max battery overload circuit breaker: shuts off the motor when the load is too heavy. How long will the G-Max 40v battery last? There are at least two sides to this question: How long can I work before the battery will need recharging? When will I need to replace the battery? The High Performance G-Max 40v 4Ah Li-ion battery charging time is 2 hours. According to the manual, with regular use it will require shorter charging times. The G-Max 40v 4Ah delivers fade-free power until discharged. An indicator reports the level of power remaining so you will know how long you will be able to work before the next recharge is needed. On a full charge the battery is stated to last 150 cuts or a cord of wood. Realistically speaking, this may be as much as the average person needs to take care of when cutting up a tree that has fallen, for example. Your typical tasks may be much less demanding, such as cutting up a dropped branch or two. Even if you need to venture into the woods for firewood and intend to spend the day bucking a cord of wood, this may work very well for you. How good are Lithium Ion (Li-ion) batteries? Pioneering work with lithium batteries began more than 100 years ago, but it wasn’t until the 1970s that non-rechargeable lithium batteries were first available commercially. Li-ion batteries are low maintenance, they have no ‘memory’, the self-discharge is less than half that of ni-cad, and they may be disposed of in the regular municipal stream (but should be recycled because you can). Li-ion batteries characteristically show some capacity deterioration after one year, whether you use the battery or not. It is not uncommon for the battery to fail between two and three years, but they may last even up to five years in certain situations. Improvements are continually being made to the chemistry of Li-ion batteries by manufacturers, so your next one may very well last even longer than your first. One important thing you can do to prolong the usable life of your Li-ion battery is to remove it from the saw and store it in a cool place, partially (40%) charged. Give it a full recharge before using it again. If an overload occurs while under heavy use, this Li-ion battery pack is equipped with an internal circuit breaker which will automatically shut off the power to the tool and then reset itself once cooled. To speed cooling you may want to actually remove the battery pack from the saw for a period of time. A big advantage of the G-Max 40v battery is that this one battery can be used for powering a variety of greenscaping power tools, including: string trimmer, pole saw, lawn mower, leaf blower and vac, and cultivator. This is the reason that the chainsaw can also be purchased without battery and charger: you may already have them for another Greenworks tool! Have you figured out that if you probably aren’t going to use your Greenworks chainsaw more than once every two years, you might as well have another Greenworks 40v tool that you use regularly to make good use of the G-Max 40v battery? Without getting into a detailed explanation which is beyond the scope of this review, a motor with brushes uses a mechanical approach for controlling the operation with the obvious problems of heat and wear that limit the life and speed of the motor, whereas a brushless motor is computer-controlled and far more efficient, with a longer life and reduced need for cooling. What else should I know about Greenworks 40v Cordless Chainsaw? Your new Greenworks G-Max 40v 4Ah Digi-pro 16″ Chainsaw does not come with the battery charged so this is the first thing you will need to take care of and while it is charging you can run out for the bar and chain lubricant, specially made for this purpose so it has the proper viscosity. Although you won’t have to deal with engine maintenance with this cordless chainsaw, you will not be able to get away from chain maintenance! The manual has detailed instructions on how to sharpen the chain, with illustrations. But you can either pass that task on to a professional or just buy a new chain! You may find that using Dupont Chain-Saver Wax based chain lube will save you from having to sharpen the chain as often. After every week of use, Greenworks recommends that the bar be reversed to ensure even wear. The low kickback chain and guide bar are made by Oregon. The saw weighs less than 10.5 pounds. 4 year warranty on parts, other than motor and battery. Is there a best electric chainsaw? Answering this comes down to how much you are willing to pay, how much you intend to use the chainsaw, and do you need the convenience that batteries offer. A corded electric chainsaw will be less expensive than a cordless, but the power source is less convenient. 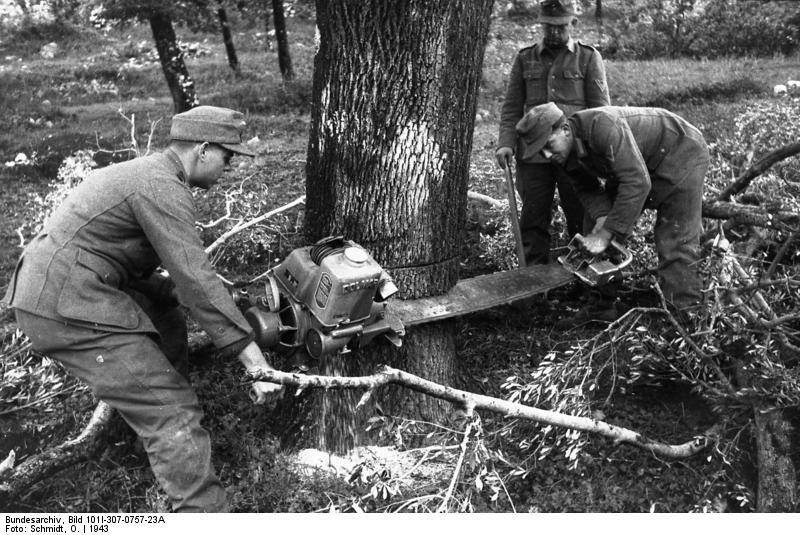 All the major manufacturers are developing technologies that will bring cordless electric chainsaws into mainstream use. Greenworks specializes in cordless electric equipment and their chainsaws are priced more affordably, while providing gas equivalent power. The Greenworks G-Max 40v 4Ah 16” chainsaw with DigiPro Brushless Motor is an amazing deal that you almost can’t afford to pass up. Sure there are better known and legendary brands that have cordless chainsaws, but the price on this one is phenomenal, the power is sufficient for typical homeowner needs, and it requires as close to zero maintenance as you will find.